We are sending these kits to at least 25 partner sites around the globe, so the kit must be cheap, compact, and simple to use. Below are the kit components and instructions. I also included a breakdown of the per-kit cost at the end. Here’s a video of me unpacking the kit. Here’s a video demonstration of the seawater filtration device. Collection: Before disturbing the plants and sediment, collect 500mL of seawater from the water column just above the plants nearby plot #1 using the plastic 500mL bottle. Repeat this collection near plots #6 and #20, such that you have three 500mL samples from each sub-site. Filtration:When you return to the boat/shore, filter the water samples using the provided filtration device. If you cannot filter the samples in the field, transport the bottles in a cooler on ice back to the lab. These samples must be filtered immediately when you return to the lab, and should not be refrigerated or frozen. Using the Filtration Device: The provided filtration device operates similarly to a “French Press” coffee maker (above ). To use, remove the inner (plunger) portion of the press. Unscrew the bottom of the press and place one of the provided filters in the bottom. The DULL side of the filter should be facing up. Note: the filter should remain in its sterile packaging until you begin the filtering process. Wear gloves or use the forceps provided to transfer the filter. Screw the bottom back onto the press. Pour as much of the collected water as possible into the reservoir and discard the rest. Fit the plunger into the reservoir, place the press into the plastic stand, with the water flow-through channels on the bottom, and apply pressure to squeeze the water through the filter. Do not allow the plunger to touch the filter (do not press it all of the way down.) Discard the water that emerges from the filter. Unscrew the base to remove the filter BEFORE pulling the plunger out of the press. The filter will tear easily, so be gentle when removing it from the press. Storage: Remove the filter from the AeroPress with gloved fingers or forceps. Fold the paper in half and cut it into 2 pieces. Fold each piece two more times and place each into one of the blue pre-labeled 2 mL vial containing buffer. The entire filter must be submerged in the buffer. Use the scissors or forceps to force the filter to the bottom of the tube. It is fine at this point if the filter is broken or torn. Record the plot number on the vial. Repeat steps b-d for the remaining water samples. Record the day and time of water collection and the time at which the samples were filtered. Place the vials back into the provided sample storage box and store at room temperature. Ship these vials to Jenna Lang at UC Davis with the Zostera and sediment microbiome samples (see below). Within 3 plots, collect 1 additional whole shoot (including the roots/rhizome) as well as sediment samples for analysis of the Zostera microbiome. If you have additional seagrass species at this site, contact Jenna Lang at UC Davis for additional collection supplies. Collection: At each of three plots, pull up one Zostera marina plant including the roots. Gently swish the shoot in the water to remove loose sediment from the roots. Process these samples in the field according to the following steps. If you cannot process them in the field, cut the shoot into two pieces (aboveground – leaves – and belowground – roots and rhizomes- tissue) and place in two separate labeled bags per plot (bags #4 and #5) on ice to transport to shore/lab; these samples must be processed as soon as possible and no longer than 5 hours from the time of collection. Processing: Pull off up to 10 root hairs and place them in a single lavender, pre-labeled, 2 mL collection vial with buffer. The roots must be fully submerged in the buffer. Next cut a 2 cm section from a healthy, green section of an outer leaf blade. Put the leaf section into a green, pre-labeled, 2 mL collection vial, fully submerged in the buffer. Storage: The box of tubes can be stored at room temperature. Repeat steps a and b for the other eelgrass plants samples. If you have additional seagrass species at your site that you would be willing to collect, please contact Dr. Jenna Lang directly for additional collection materials. Collection: Near where you collected the eelgrass shoots for section 1, above, collect a sediment sample. Each sediment sample should be collected using one 6cc syringe (provided). Insert the barrel of the syringe into the sediment and, at the same time, carefully and slowly pull back on the plunger so that the sediment surface remains intact and in place while the syringe barrel is pushed into the sediment. Remove the syringe from the sediment. Next extrude the sediment until the base of the plunger is at the 3cc mark. Use the plastic spatula to transfer approximately 0.25 grams of sediment in the syringe into a pre-labeled 2mL collection vial with buffer. The sediment should be fully submerged in the buffer solution. If not, use the spatula to push the sediment down and shake the vial so that the sediment rests at the bottom fully covered by the buffer. Place the vial back into the provided sample storage box and discard the excess sediment. 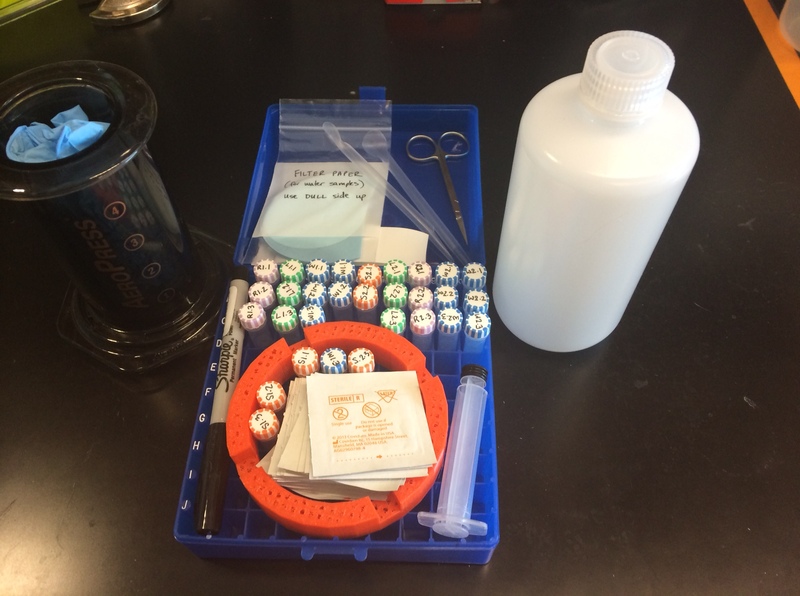 Use an individually-wrapped alcohol swab to clean the syringe and spatula between samples. Storage: This tube and box can be held at room temperature. Repeat steps a and b for other sediment samples. Samples should be stored in the tubes with buffer at room temperature and shipped, along with the filters from the water collections, within 2 weeks of collection to Dr. Jenna Lang at UC Davis. I was wondering how you sterilize the aero press in between water sample filtering? or is it not a concern because you are filtering triplicate water samples from the same source? 2) Amplification and cloning of 16S rDNA.